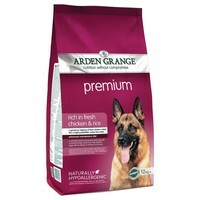 Arden Grange Premium Adult Dog Food (Chicken & Rice) is an enhanced maintenance diet for discerning adult dogs with a normal to high activity level. It is particularly ideal for dogs with an allergy or intolerance to maize. Made with a generous helping of fresh chicken for its high level of protein and delicious flavour, the diet is extremely palatable and contains a concentrated source of nutrition that ensures sustained energy levels, suitable even for working dogs. Arden Grange Premium is a maize/corn free recipe.